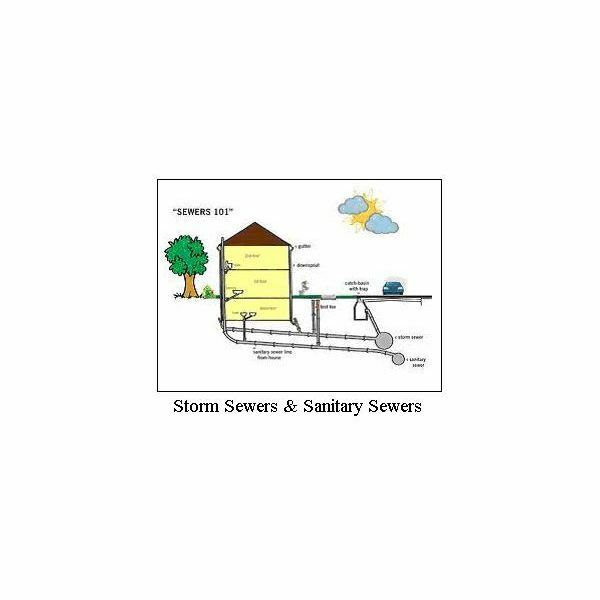 Stormwater management is used to drain storm water runoff from some location and allow it to dissipate slowly either to groundwater or to surface water. A dry well is an underground structure that takes in storm drainage and releases it to the groundwater below it, so the stormwater doesn’t go to a river or stream. The structure might be a concrete or plastic tank or might simply be an excavation filled with gravel, rubble or something similar that has adequate volume to catch storm drainage and allow it to seep out. concrete or plastic tank can be used, as shown in the diagram at the left. The concrete or plastic tank must have holes in the sides and bottom, as shown in the picture, to allow collected storm drainage to seep out. The figure at the right shows another option, simply a hole, lined with filter fabric, and filled with 1.5" to 3" stone fill. 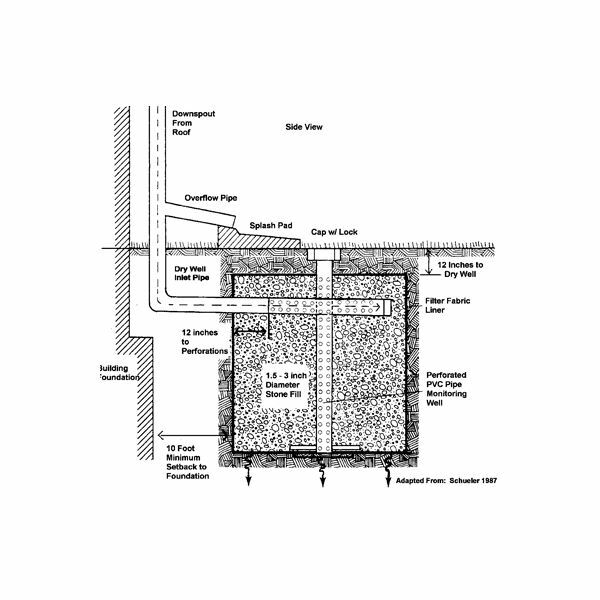 The figure shows this type of rock-filled dry well being used to catch downspout stormwater and release it to groundwater. A simple rock-filled dry well can also be installed under a soggy spot in your yard to make it dry out faster. The proper test to check on whether a dry well will work to drain storm water runoff at your location is a percolation test, also shortened to "perc test." To begin the perc test dig a four foot deep hole in the place you hope to put in a dry well. A posthole digger or soil auger works well for this task. If the hole fills in with groundwater, then the groundwater table is too high for a dry well to be used, because it won’t drain. When the hole has been dug, pour at least 5 gallons of water into the hole. Measure the time taken for each one inch drop in water level. If the water level drops at 3 minutes per inch or faster, it is a good candidate for a dry well. If the water drains very quickly, fill the hole again check the rate that it recedes. Very dry soil of any type will absorb water very quickly. For good storm drainage the second 5 gallons should drain at a good rate also. If the water drains very slowly or the hole remains full for a long time with no perceptible drop in level, then a dry well won’t work in that location. The top of the dry well should be far enough below the ground surface to prevent freezing. A depth of at least 36 inches is often used. The bottom of the dry well should be at least 2 feet above the seasonal high groundwater level. For a plastic drum, 1 inch holes drilled in a random pattern around the side and bottom of the tank are needed for drainage. 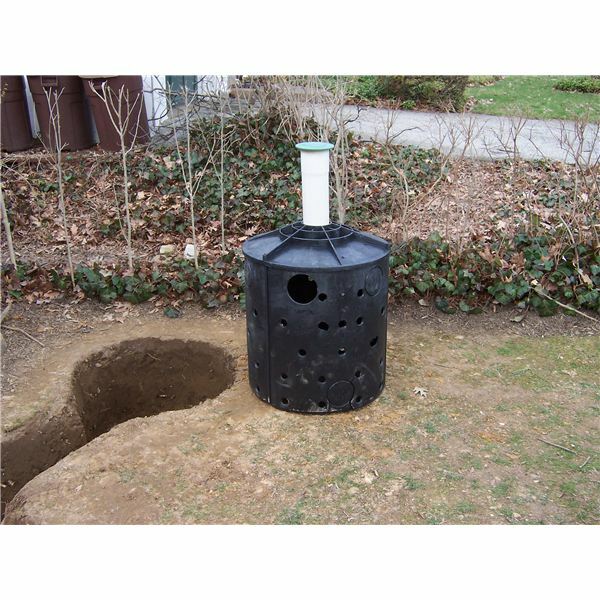 Filter fabric should be wrapped around the top and sides of a dry well tank, so that fine soil won’t clog the holes. For a rock-filled hole, use filter fabric around the sides of the excavation and over the top of the rocks to prevent soil from clogging up the rock fill. At least 6 inches of drain rock should be placed under a dry well tank. If rock fill is used, as in a rock-filled hole dry well, 1-1/2" to 3" diameter washed rock is a good size to use. Dr. Harlan Bengtson is a registered professional engineer with 30 years of university teaching experience in engineering science and civil engineering. He holds a PhD in Chemical Engineering. 1. 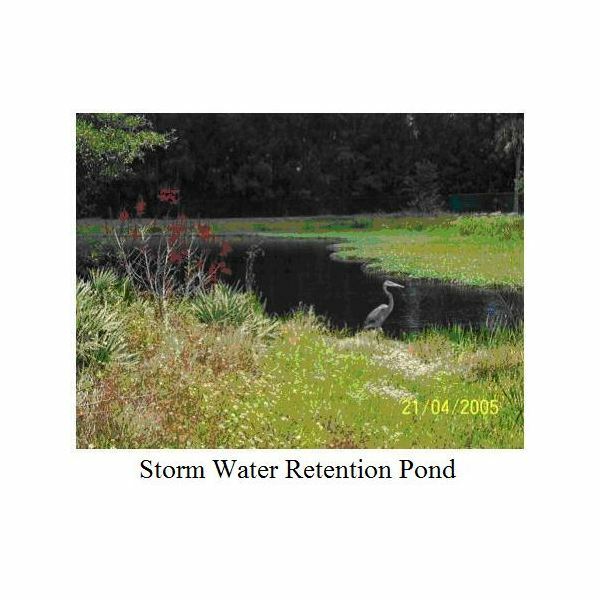 The Stormwater Detention Pond and Stormwater Retention Pond – Why Are They Needed? – Development on a watershed causes increased peak stormwater runoff rate from the watershed, thus increasing downstream flooding problems. 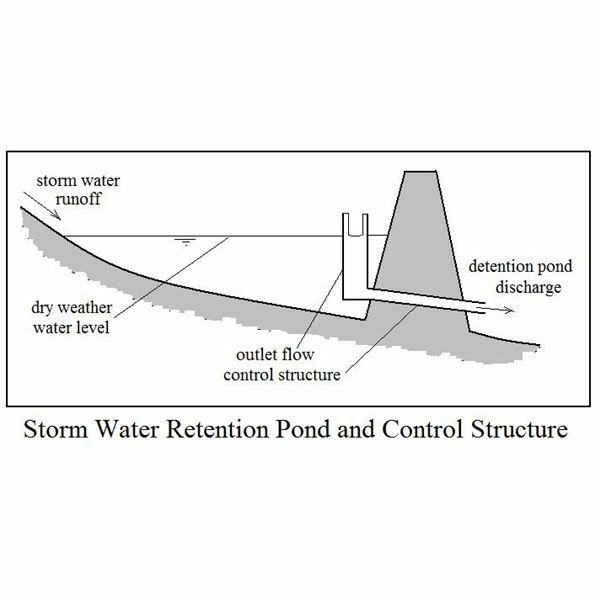 A stormwater detention system such as a detention pond or retention pond will store stormwater runoff and release it slowly, thus reducing downstream flooding. 2. 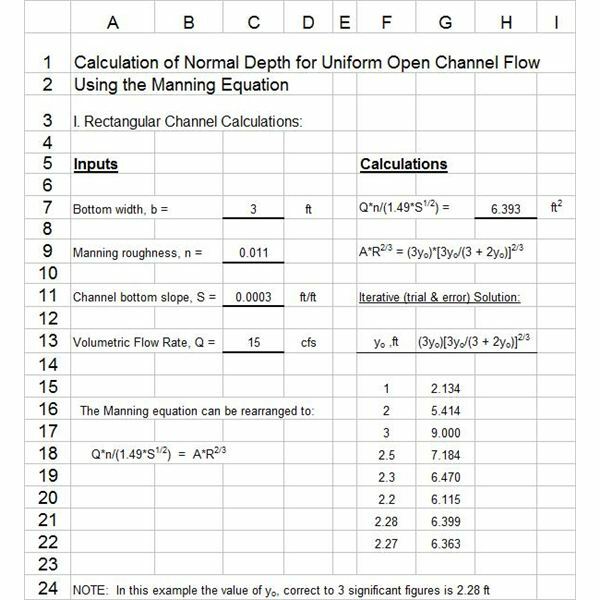 The Rational Method for Calculation of Peak Storm Water Runoff Rate – The Rational Method is used to calculate the peak surface runoff rate for design of storm water management structures, like storm drains, storm sewers, and storm water detention facilities. Values for the runoff coefficient, drainage area, time of concentration and design return period are needed. 3. 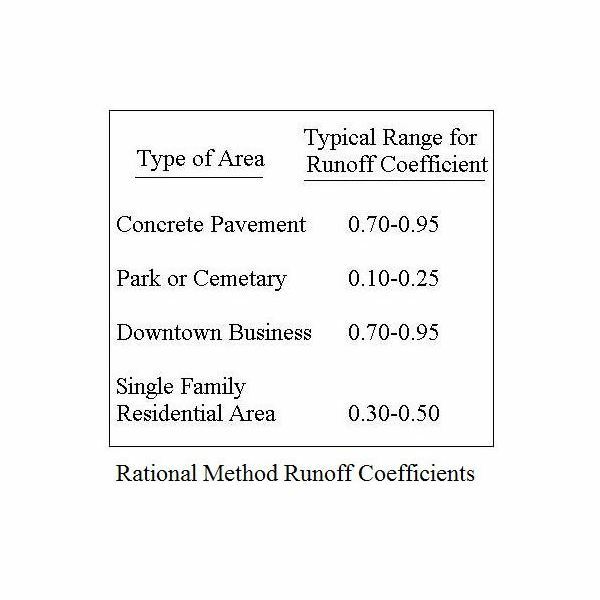 Calculating Design Rainfall Intensity for Use in the Rational Method – Rainfall intensity for the design storm is needed to calculate peak runoff rate from a drainage area for the design of stormwater structures using the rational method. Time of concentration, return period, and an IDF relationship are used to calculate design rainfall intensity. Here we show how.